Gluten has gotten a bad rap lately—it was practically a four-letter word when we started working on Modernist Bread—but in the world of bread, it’s your friend. As Jimmy Kimmel discovered, there’s a bit of confusion about what gluten is and what it does. Whether you avoid gluten or can’t get enough of it, we think it’s important to understand how it works. Gluten is a protein found in wheat products. In bread making, it’s exceedingly important. Think of gluten as the miraculous net that holds the bread together; it helps the dough rise by trapping gas bubbles during fermentation and gives bread its unique texture. Although bread begins with many of the same ingredients as cookies, pastries, cakes, and even shortbreads, it has a completely different consistency. Gluten makes bread airy and satisfyingly chewy—it’s hard to imagine enjoying a chewy cake or a bread that crumbles like a cookie. Gluten is formed when two of wheat’s native proteins, glutenin and gliadin, come into contact with water. That’s why it’s more accurate to talk about the gluten potential of a particular flour, rather than its gluten content. Either way, you phrase it, the more gluten a flour can produce, the more the dough is able to hold gas bubbles, and those gas bubbles are what gives the bread an open crumb. Adding water to flour starts a chemical process that can eventually lead to gluten development. When we grind wheat flour, we destroy the structure of the seed (the cells and organelles), preventing germination. But a cascade of chemical reactions will still occur when the flour is hydrated because the materials that cause the reactions are still present. Gluten development occurs when we add water to flour and let the enzymes work as they were intended. From a baker’s perspective, gluten development begins during mixing. The basic point of mixing is to hydrate the flour. Mixing matters not because it is necessary to develop gluten; you can develop gluten with minimal mixing (there really is no need to knead). Mixing is essential because it speeds up the hydration process and ensures that water is evenly dispersed throughout the flour. When hydrated, the glutenin and gliadin proteins almost immediately bind and form gluten. The longer glutenin pieces link up with each other via disulfide bonds to form strong, stretchy units of molecules. These interlinked strands are among the largest protein molecules yet identified. More compact gliadin proteins allow the dough to flow like a fluid, whereas glutenins contribute to strength. Although hydration happens quickly, it takes time to form the chemical attachments that knit gluten proteins together into a strong network. Proteases (protein-snipping enzymes) begin cutting strands of gluten into smaller pieces that are able to make additional connections. Protease is found in very small amounts in wheat flour; an excess of it would cut gluten strands too much and have the opposite effect on the gluten network. 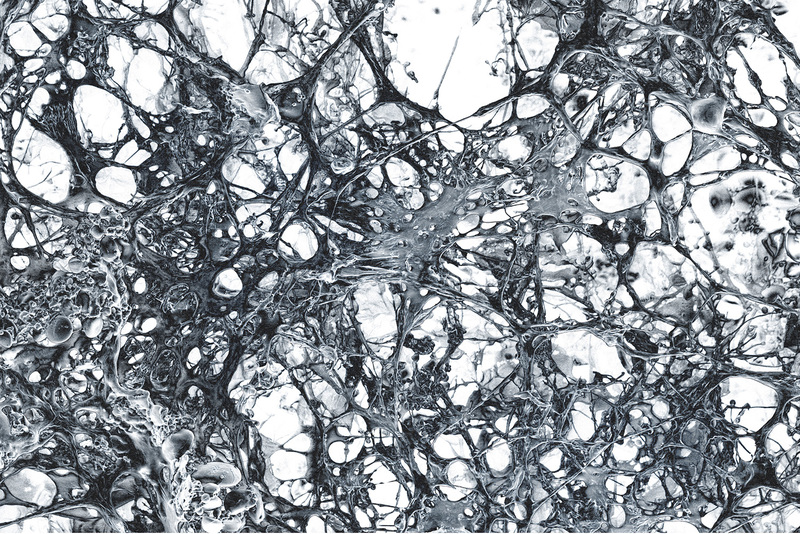 As mixing continues and the ingredients transform into dough, the chains of proteins become more numerous and elongated; they organize into a sort of webbing (the network can be seen in the image above, which was taken with a scanning electron microscope) that has both elasticity (the ability to stretch) and extensibility (the ability to hold a shape). Without this little protein tango, bread would be a very different thing: flatter, crumblier, denser, and less chewy. The network of gluten will continue to develop, gradually becoming stronger and more complex, up until the dough is fully proofed. Enzymes have even more time to act while the dough rests and begins to ferment. Chains of gluten grow longer and stronger as more and more molecules stick together. During bulk fermentation, bakers periodically fold the resting dough to help align the gluten strands into an even, organized structure, which gives the dough the integrity it needs to expand as the carbon dioxide produced by the yeast and water vapour are introduced into the bubbles. When the gluten network is strong enough, the dough can be shaped. Bakers check gluten development by performing the windowpane test, which involves stretching a portion of dough in your hands. 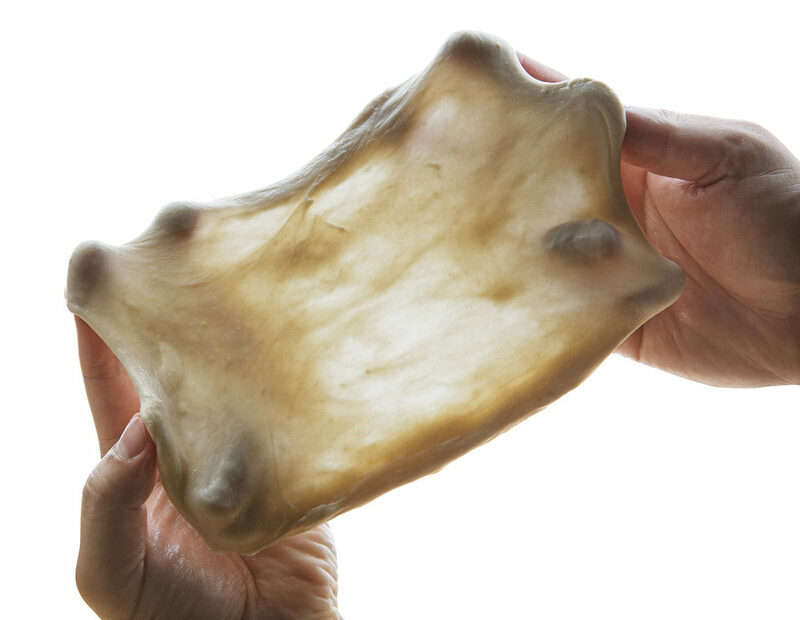 A well-developed dough can be stretched so thin that it’s translucent. Gluten strands tighten and reorganize once again as the dough is divided and shaped. The tension created during shaping helps the dough expand at a steady rate, producing uniform loaves. Most of the carbon dioxide produced during fermentation happens in the final proofing stage. The largest volume increase comes during baking when the dough nearly doubles in volume in the oven. To expand during both processes, the dough must be strong enough to retain the gas that’s produced. Gluten makes the dough elastic enough that the bubble walls can expand like a little balloon without tearing up until the point where the bread over proofs. When carbon dioxide exerts more pressure than a proofed dough can withstand, the gluten structure weakens, releasing the gas and deflating the over-proofed dough. There are other factors that influence gluten development, such as the type of flour you use. 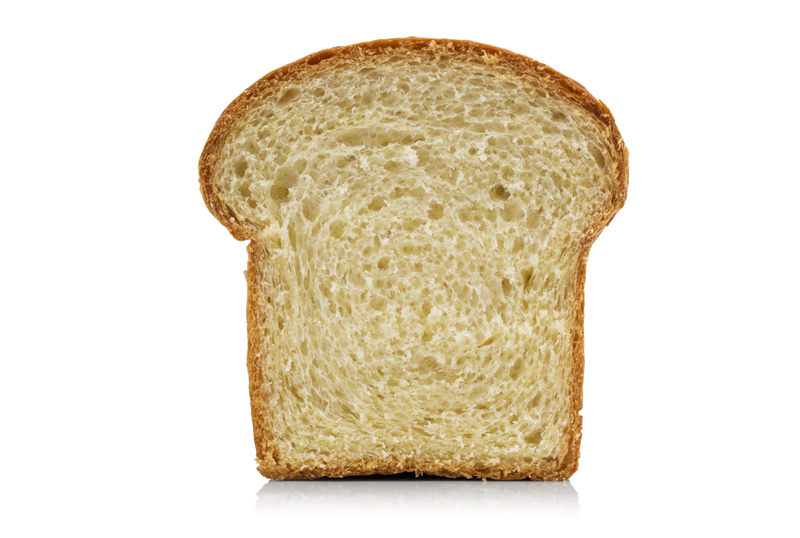 Generally, bread bakers are shooting for an 11%–13% protein level, which will give good volume and texture to a loaf. Protein content varies among flours, and in most cases the higher the protein content, the more gluten the dough can typically form. This doesn’t mean that one flour is better than another; rather, different types of flour are better suited for different purposes. We use lower-gluten flour when we want to make the cake, for example, because it won’t form a gluten network that can make a cake’s texture rubbery. Some wheat varieties, including semolina and most ancient grains, don’t have good gluten-forming properties, which is why they are often blended with other wheat flours in bread recipes. Whole-grain wheat flours contain plenty of protein, as well as bran and germ, which chemically and physically affect the strength of the dough. The thirsty particles prevent proteins from fully hydrating, excrete compounds that weaken gluten and can create microscopic holes in the wall. Other grains, including rice and corn, can’t form the gluten protein at all, although they do contain other proteins. Rye is a special case. It has some gluten, but not the kind that creates a network that makes for a light and airy bread. Rye becomes bread largely by means of pentosans. These polysaccharide molecules form a sticky gel when mixed with water. That gel—not gluten—is what gives bread with a high percentage of rye their structure. The quantity of water present also plays into the gluten-forming process. Adding too little water won’t work; the flour must be sufficiently hydrated to activate the proteins that form gluten. Too much water also causes problems, resulting in more of a batter than a dough, in which a gluten network will form but never produce a cohesive mass. Salt provides more than flavor—it strengthens gluten bonding. Although the gluten proteins naturally repel one another, the chloride ions in salt help them overcome that repulsion and stick together. You can see this change happen within dough when you add salt later in the mixing process: as the salt mixes in and dissolves, the tacky dough firms up. Fats, such as butter and oils, slow down the gluten-forming process by coating the protein strands, which is one reason enriched doughs such as brioche call for longer mixing times. The coating acts as a barrier that prevents gluten proteins from sticking to one another, stunting the growth of long chains. It’s because of these clipped strands of gluten that we can intricately shape enriched doughs, such as challah. With a small addition of solid fat (1%–3%), the lean dough becomes stretchier (allowing it to rise higher) and easier to handle. Fat-enriched recipes, like brioche, can call for large amounts of fat. Fat in these quantities hinder gluten formation and lead to a soft, tender crumb that is more like that of a cake. Certain inclusions can have the same weakening effect. Any inclusion that contains lots of gluten-killing enzymes, for example, is generally tough on the dough. That includes raw papaya (rich in papain) and pineapple (high in bromelain). A workaround is to cook these ingredients first; high heat destroys the enzymes. Time serves as a general tool for controlling gluten development; the longer the flour and water spend together during the hydration process, the more numerous the gluten bonds will be, while a longer mixing time will speed up hydration by forcing the water into the flour. Time also allows enzymes to assist in gluten development, and most notably extensibility. Mixing method matters. Hand-mixing techniques won’t hydrate the dough—and develop the gluten—as fast as machines. Using an electric mixer can make many breads feasible that would otherwise be difficult to mix by hand, like challah. The next time you make bread, keep these factors in mind. If you want a taste of Modernist Bread, give our Chocolate and Cherry Sourdough, Portuguese Sweet Bread, and Pork Cheek Hum Bao recipes a try. Posted in Article and tagged gluten. Bookmark the permalink. Who doesn’t like a nice pastry!